The talented folks from Norfolk who ran the X-factor session at the symposium have now posted their evaluation on YouTube. Well done guys. You’ve joined a small group who have actually posted something about their attendance at the symposia. A group that sadly doesn’t include its sponsor the DCLG or ICELE. The event’s own web-site doesn’t ask for feedback. For an event primarily about using the internet the organisers are scarily poor at doing so. 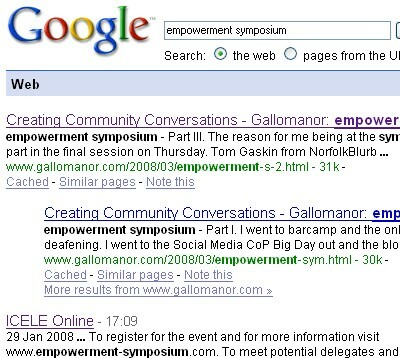 With only a quiet Facebook group it is not surprising that the top Google Search for Empowerment Symposium is this blog rather than the event site.